EOO 359 km², plants at two remaining locations continue to decline due to ongoing habitat loss and degradation. 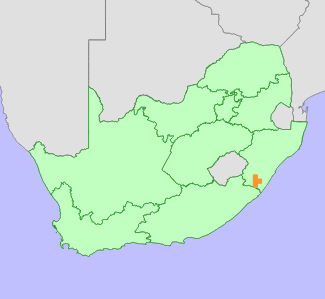 Creighton to Harding, southern KwaZulu-Natal. Mistbelt and coastal grassland, 900 m.
Very little of this species' habitat remains intact, after extensive loss to timber plantations, sugarcane cultivation, and rural settlements. Habitat loss continues rapidly as rural settlements continue to expand across this species' remaining habitat. Both known remaining subpopulations are threatened by habitat loss to settlements as well as overgrazing. This species is not known to occur in any protected areas, and is in severe danger of extinction. This species historically had a very limited distribution range, and within this area, more than 80% of grasslands have been lost or degraded. 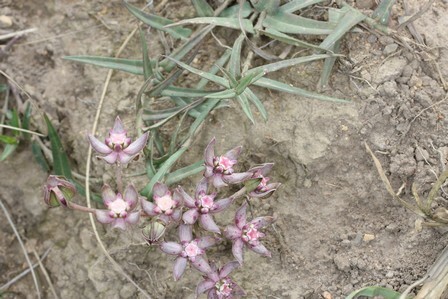 Currently only two subpopulations are known to remain near Harding, in the southern part of this species' former range. Nicholas, A. 1982. 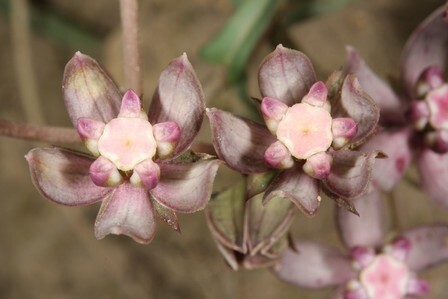 Taxonomic studies in Asclepias (Asclepiadeae) with particular reference to the narrow-leaved species in southern Africa. University of Natal.